Buy Granovita Gourmet Pate - Chickpea 125g in the UK from our online shop or directly from our independent Scottish store. A delicious gourmet vegetarian organic tofu pate made with chickpeas, herbs and spices. Water, chickpeas (25%), non-hydrogenated palm fat+, nutritional yeast (8.3%), leek, onion, carrot, non-hydrogenated sunflower oil, cracked wheat (gluten), potato powder, vegetable bouillon* [sea salt, maize starch*, vegetable mix* (onions*, parsnips*, carrots*), glucose syrup* (from maize*), sunflower oil, spices* (turmeric*, ginger*, nutmeg*, pepper*), herbs* (parsley*, lovage*, bay leaves*)], sea salt, garlic, natural smoke flavour, spices* (0.5%) (tumeric, cumin, fenugreek, nutmeg, cinnamon, mustard seed, black pepper, ginger, cardamom, cayenne pepper), herbs (0.2%) (coriander, oregano). Where can you buy real Granovita Chickpea Pate safely online? 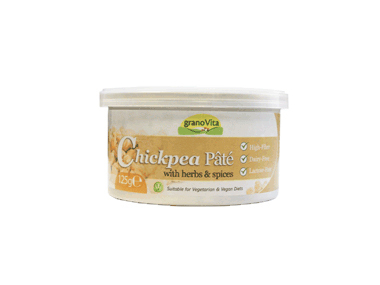 If you are wondering where you can buy Granovita Gourmet Pate - Chickpea 125g safely online in the UK, then shop with us. Granovita Chickpea Pate - Granovita Gourmet Pate - Chickpea 125g in Vegetarian Pate and Honeys, Jams & Spreads.